​Some of the most famous surviving tales from Greek mythology relate to events before, during and after the Trojan War, and the heroes Achilles, Ajax the Great, Diomedes and Odysseus are arguably the most famous mortals to be found in Greek mythological tales. These four heroes though were all Achaean heroes (Greek heroes) who came to Troy to retrieve Helen, the wife of Menelaus. Less famous are the names of the defenders of Troy, although people are likely to have heard of Paris, effectively the prince who brought the Achaeans to Troy, Aeneas, the famous Trojan survivor of the war, and to some the name of Hector is equally recognisable. ​The story of Hector primarily comes from Homer’s Iliad, one of the two complete works from the Epic Cycle. At the time of the Trojan War, Priam was on the throne of Troy, having been made king by Heracles years earlier, following the death of Priam’s father, Laomedon. 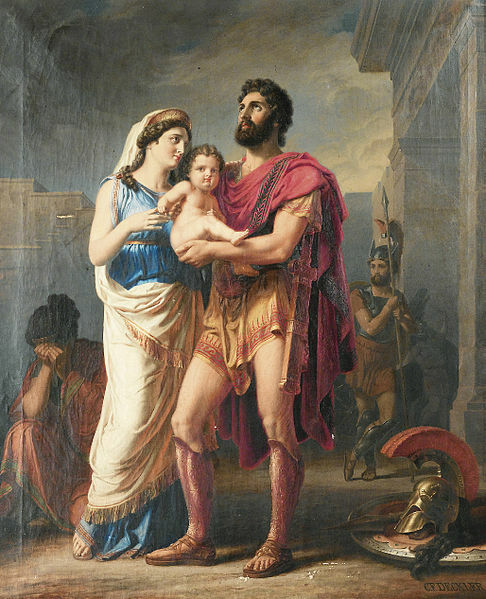 Under Priam, Troy prospered, and his family line seemed secured, for Priam was blessed with a large number of children by many different wives, with some saying that Priam had 68 sons and 18 daughters. The most famous of Priam’s wives was Hecabe, and the eldest son born to Priam and Hecabe was Hector. Hector would grow up in Troy as heir apparent to Priam, but Fate would intervene to ensure that prince Hector never became King of Troy. Hector of course comes to the fore during the Trojan War, and the surviving sources tell little of his life before the arrival of the Achaean force. Yet, whilst the Achaean fleet was gathering at Aulis, such was the reputation of Hector that the Greek heroes recognised that they would have to overcome the man regarded as the mightiest of all Trojan warriors. 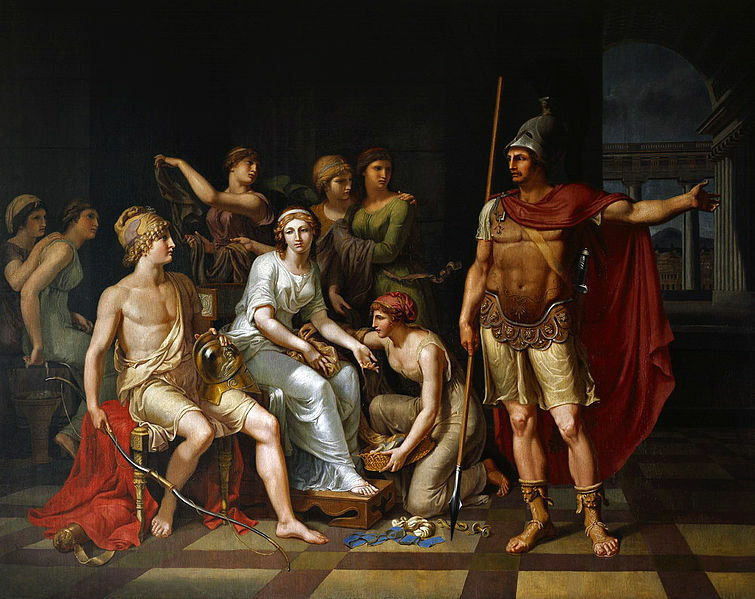 ​In Troy, Hector would wed Andromache, a Cilician princess; with Andromache becoming one of the famous Trojan Women. Hector would later have one son by Andromache, a boy called Astyanax. Andromache is almost universally portrayed as the perfect wife, supportive of her husband, and the perfect future queen of Troy. Despite this though, Andromache would plead with Hector on occasion not to leave the safety of Troy to enter the battles raging outside the city war. Hector though would fight on, putting his duty to defend Troy above the duty of a loving husband, fighting on even though Hector recognised the inevitability of defeat. It was this duty to his city, as well as his courage and piety, which also saw Hector regarded in the highest esteem by Ancient Greeks, who heard the tales of Troy. ​With the arrival of the Achaean forces at Troy, Hector chastises his brother Paris for bringing potential destruction to their home, and also belittles him when Paris refuses to fight Menelaus in single combat, a fight which potentially could have avoided fall scale war. Nevertheless the duty bound Hector leads the Trojan defenders against the invading army. Hector is normally credited with killing the first Achaean hero, Protesilaus, of the war; Protesilaus being the first Greek to set foot on the beaches outside of Troy. Eventually, despite the best efforts of Hector and Cycnus, the Achaean’s gain a foothold on the beaches and men pour forth from the 1000 ships of the Achaean fleet, and the ten year war commences in earnest. Throughout the war, Hector is at the forefront of the Trojan forces, and Hyginius’ Fabulae, the author claims that Hector alone killed 30,000 of the Achaean army; although most sources put the complement of the entire Achaean army at somewhere between 70,000 and 130,000 men. The heroes of the Trojan War though are normally described in terms of the opposing heroes that they killed, and Hector was said to have killed 30 Achaean heroes, including Menesthes, Eioneus and Trechus. Hector is best remembered though for fights with three Greek heroes, Ajax (the Greater), Patroclus and Achilles. The prowess of Hector results in some reticence amongst the assembled Achaean heroes to test themselves in single combat with Hector. Recognising that they could not decline the challenge, several volunteers eventually appear, and lots were eventually drawn, with Ajax the Great (Telamonian Ajax), exiting the Achaean camp to do battle with Hector. The fight proves to be a long and exhausting one, lasting through until dusk. Hector and Ajax prove to be evenly matched with neither man able to obtain a significant advantage. Hector and Ajax eventually agree to call off hostilities, resulting in a drawn fight. Both Trojan and Greek are taken with the courage and skill of the other, and thus gifts are exchanged between the two heroes. Hector gives to Ajax a sword, whilst Hector receives from his opponent a girdle; later in the war, both gifts received would be linked to the demise of their new owners. ​The Trojan War would drag on, with the Achaean forces unable to breach the walls of Troy. Other cities allied to Troy would fall though, but this only led to disagreement between the Achaean heroes, and the division of spoils between Agamemnon and Achilles after one such victory, resulted in Achilles withdrawing from the battlefield and refusing to re-join. The absence of Achilles in the Achaean ranks, galvanised the Trojan defenders, and counterattacks now emerged from Troy. One such attack saw the Trojans come close to burning the Achaean ships, and still Achilles refused to fight. Achilles though did agree to loan his divinely crafted armour to his closest friend Patroclus; and at the head of the Myrmidons Patroclus ensures that the ships are not destroyed. Achilles expected Patroclus to return immediately after defending the ships, but Patrolcus pushes on, and thus encounters Hector amongst the Trojan forces. Wearing the armour of Achilles did not imbue Patroclus with the skill of the Achaean’s greatest warrior though, and Patroclus proved not to have the skill to fight on equal terms with Hector; and Patroclus soon lies dead, skewered upon Hector’s spear. Hector removes the armour of Achilles from Patroclus, but the body of Patroclus is left untouched due to the defence of Ajax the Great and Menelaus. ​The success of Hector against Patroclus proves to be a turning point in the war, but not a turn in favour of the Trojans. The death Patroclus sees Achilles emerge from his tent, don new armour, and enter the battlefield once again. Initially Hector stays behind the walls of Troy for a prophecy had been made that Hector would die at the hands of Achilles. Hector observes the death of many Trojan soldiers and his sense of duty once again sees him enter the battlefield. Achilles and Hector are destined to meet, but the gods are also interfering, for Athena is aiding Achilles, for as well as bringing weapons to Achilles, Athena also tricks Hector into believing that he has help. Realising that he is doomed, Hector decides to make his death memorable and glorious, and taking up his sword he charges at Achilles, whereupon, is struck down by Achilles’ spear, which pierces his neck. With the fall of Hector, Troy has lost its greatest defender, and also its last hope. Victory over Hector does nothing to soothe Achilles anger over the death of Patroclus, and Achilles, and rather than return the body of Hector to Troy, Achilles plans to destroy the body. Thus the body of Hector is strung by its heels, using the girdle of Ajax, and attached to Achilles’ chariot. For 12 days Achilles rides around Troy pulling the body of Hector behind him, but the remains of Hector come to no harm, for Apollo and Aphrodite protect it. Word then comes from the gods that Achilles must end his persecution of the body of Hector, and allow the body to be ransomed. King Priam would exit Troy and enter the Achaean camp to seek Hector’s body, and aided by Hermes, the father of Hector goes unseen until he enters the tent of Achilles. Priam pleads with Achilles for the body of his son, and taken by the words of the king, as well as the warning of the gods, Hector’s body is released into Priam’s care and Hector returns one last time to Troy. Troy mourns the loss of their greatest defender, whilst Andromache mourns the loss of her husband; and in the agreed 12 day truce funeral games are held for Hector, just as funeral games had been held for so many Achaean heroes. Some tell of how the Tomb of Hector was subsequently not found in Troy but in the nearby city of Ophryneion, with the bones of Hector subsequently moved generations later to Thebes.